Peter Scudamore is a former horse jockey and eight-time champion jockey, and the subject of this March 2019 release from Netent. The branded slot, played out on 5-reels and up to 32 fixed paylines, is rather unique as for as themes go. This one, as it so happens, also comes with some rather unique features that include random wilds, Peter's Classic Cup and what is referred to as the Bet Slip Feature. Reach the finish line first to collect up to x5,000 bet! The slot has a brilliant and inspirational soundtrack that lifts your spirit, like a day at the track, and builds anticipation as you race towards the finish line. You can hear the thundering of hooves and the neighing of magnificent steeds. Using digital images, Netent captures the exhilaration of the sport with four high-value jockey and horse symbols: Divine Fortune, Berry Max, Gonzo's Quest and Tin Foil Hat. There are also four low-value royal flush poker symbols. The horse names are no coincidence. In fact, we could accuse Netent of being cheeky here. That's because the first three horses happen to be the titles of other very popular slots from this developer. We had to do our homework on the Tin Foil Hat name though, and found that this a cheeky jab at gamblers who are of the opinion that slots are rigged. 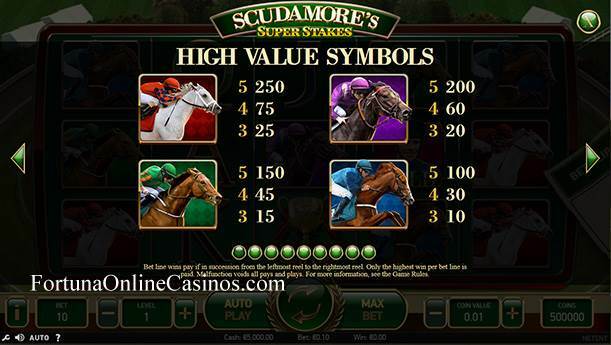 We recommend trying Scudamore's Super Stakes for free here before playing with real money. We can recommend some quality casinos that let you get started! Scudamore's Super Stakes slot has a number of things going for it. First, branded horse-racing themes are rare so if you're going to make one, why not slap Peter Scudamore's name on it? The game uses beautiful colours, digital images and a thematic sound track – not surprising at all from Netent! The features will all keep you entertained. The Random Wilds are much more difficult to trigger and it may nor may not payoff when it does, but the odds are certainly better. We liked the uniqueness of Peter's Classic Cup which is not the easiest to trigger either. It's a fun game to watch unfold and the running commentary from Scu is the cherry on the cake. At up to 5,000x bet, the potential winnings can be great. As you can imagine though, picking the outcome of the race, even with just four horses, is extremely difficult. The Bet Slip Feature can be hit and miss, but it is an interesting add-on feature which can payout up to 1,242x the bet. Overall we liked the games for the reasons we gave above and would recommend it to someone who is a horseracing enthusiast who can appreciate the high risk/high reward stakes of a high variance slot. Surprisingly, we didn't mind that there are no free spins or re-spins as the other features more than compensate. Game features include a wild symbol played by Peter Scudamore, a.k.a. Scu, which replaces all of the high-value and low value symbols. Collect 3, 4 or 5 of Scu left-to-right on his own payline to take home 100, 300 or 1,000 coins. The Random Wilds Feature may trigger during the main game and position from 2 to 5 horseshoe wilds on random positions. Peter's Classic Cup, triggered by 3 trophy cup scatter symbols, gets you in on the horse racing action. 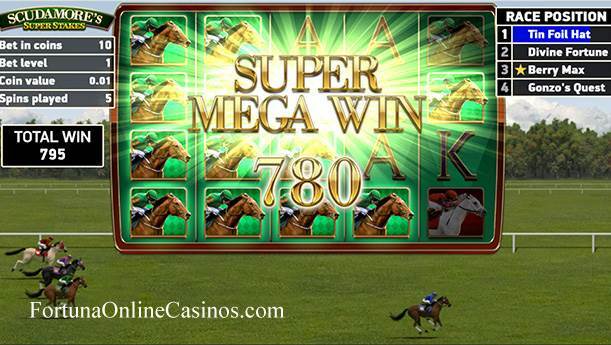 Choose the winning horse to collect upwards of 50x, 100x, 500x or 5,000x bet with paylines that extended from 20 to 32. The higher the multiplier, the lower the probability of that particular horse winning. You even get running commentary on the race by none other than Peter Scudamore. The Bet Slip feature is a side bet bonus feature that you may buy into during the main game. Effectively it tracks the number of times a specific symbol appears for a pre-determined number of rounds and awards a pre-determined multiplier based on your bet. Not surprisingly, this modern slot has been designed to be fully exploited on mobile, tablet and desktop. It's the equivalent of a day at the track using an Android or iOS device.